Amid our tech landscape of smart phones, smart homes, smart speakers, sneakers, and just about every other technologically-equipped smart thing you can imagine, we’ve witnessed a particularly sharp rise in the adoption of high-tech systems designed for smart home security and hassle-free control. When it comes to safeguarding your home with a smart security system, luckily the market is ripe for the picking with options, like the Zmodo Pivot wireless all-in-one camera security system, or even the more advanced Oco2 Full HD Wi-Fi security camera. While these camera-aided home security solutions have surged in popularity in step with the rise in smart home adoption, and are certainly innovative security tools meant to make protecting your home simple, they might not be the most effective options for a number of reasons. Chief among them would be the camera’s limited scope of coverage — so unless you’re confined to living in a 12-by-12-by-12-foot cube, you’re probably going to need more than one to up your chances of holding down the entire fort. If a camera-based home security solution doesn’t sound like it would work for your needs, luckily there’s another new and advanced option on the market. 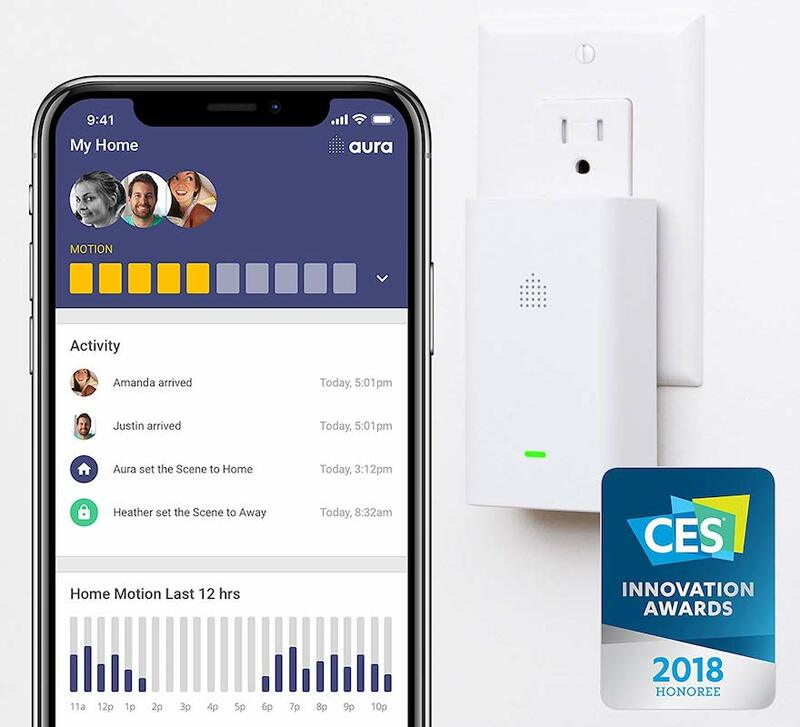 Enter the Aura Home Monitoring Advanced Motion Sensing System, which utilizes incredibly advanced technology — packed into small, palm-sized beacon sensors — to detect motion anywhere in your home. In the simplest terms possible, the Aura home security system is designed to continuously measure the patterns and wavelengths generated by your home’s Wi-Fi signal as they swirl and dance and ricochet around your house. If anything in your home moves abruptly, these Wi-Fi patterns would be disrupted as a result, and the Aura system would not only sense that, but can even be programmed to trigger other security events within your smart home system. ADVANCED MOTION SENSING SYSTEM – Easily monitor motion in your home right from your smartphone. Get notified as family comes and goes and receive alerts if motion is detected while you’re away. EASY TO INSTALL – No tools required. Plug in the sensors, download the app and get set up in less than 10 mins. MAINTAIN PRIVACY – Perfect for places where you don’t want a camera. WHOLE-HOME COVERAGE – Aura detects motion through walls – only a few sensors are required to cover your entire home. SMART HOME INTEGRATION – Works with Amazon Alexa, Google Home and IFTTT. NO SUBSCRIPTION FEES – Free 7-day motion history. You can get your hands on Aura Home’s complete Advanced Motion Sensing System starter kit — which includes one beacon, one base station and more — for $198.99. Each bacon sensor is designed to cover approximately 700 square-feet in your home, and additional beacons can be purchased as add-on accessories to expand your coverage for $98.98 apiece.